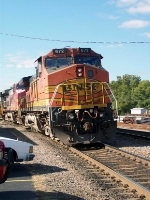 Description: BNSF freight in northern Oklahoma on the former Santa Fe main. Description: Assorted power waiting for service and assignment at the BNSF Galesburg yard. Description: An elusive manifest rolls across the bridge headed for points east. Description: A quardrant of GEs lead an empty grain train into Argentine Yard, this angle is a big "no no" as we got called in by this crew. Description: Lite power from an empty feed train heads back to its train after helping a stalled coalie up the Spoon River Valley. Description: X GUCPEI heads thru town, I imagine hes running a little late lol. Description: Westbound BNSF Kansas City, KS (Argentine Yard) to Pasco, WA manifest train H-KCKPAS9-26 runs up the St Joseph Subdivision. BNSF C44-9W 672 (ATSF Warbonnet Repaint) and CN SD75I lead 54 loads, 33 empties, 6362 tons, and 6179 feet of train with power - ETD BNQ 43407 on the rear. The first 11 cars are Boeing Hi-Wides with three aircarft fuselages in tow. Description: Coming past Rushville is BNSF Train H KCKPAS9 26 with 3 Boeing 737 Fuselages on the head end. 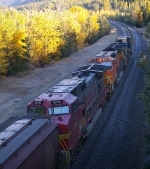 Description: BNSF Train H KCKPAS9 26 passes under US Highway 59 with 3 Boeing 737 Fuselages on the head end. Description: Really neat to see them sweeping around this connection!